The tech geeks around the globe are zapped with the launch of new iPad 2. Apple has boosted the feature set and enabled best in class app support for the master device in seemingly shorter span of time. The new iPad promises to offer a lot more to the end users than the preceding version and is custom built around the fine requirements of the end users. The overall design and usability experience has been enhanced by Apple in the newer version in order to make the device more scalable and effective each time the end users wish to leverage from it. The device would leverage from the legacy architectural framework and boost up the overall feature set in a manner so as to befit the end user needs in seemingly no time at all. They can end up saving a lot of resources and channelize their business requirements in an apt manner. The best in class communication device is all set to threaten the laptop and PC makers of the globe with its supreme capabilities. One should act in a methodical manner and choose Apple’s iPad 2 as their next tablet PC in order to benefit from the best technology enabled features. The new iPad 2 weighs 1.33 pounds for the Wi-Fi model and 1.34 pounds for Wi-Fi + 3G model. iPad weighed 1.5 pounds for the Wi-Fi only model and 1.6 pounds for the Wi-Fi + 3G model. The overall height and width of both the models is pretty much the same at 9.56 inches by 7.47 inches. The depth of iPad 2 however, is 0.34 inches as compared to its predecessor which was 0.50 inches in depth. 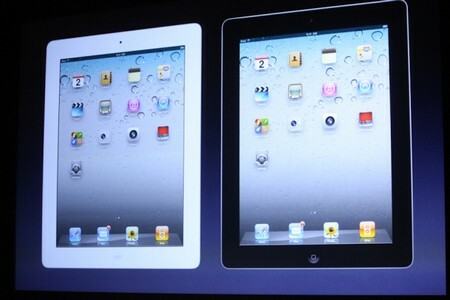 As a result, iPad 2 has been shaped up to look sleeker and attractive. The sleeker look has made the new iPad portable, classy and a stylish gadget to flaunt at work or while within the social circle. Apple has not changed the display configuration as far as the display of the device is concerned. Both the versions are powered on 9.7 inch (diagonal) LED- backlit glossy multi-touch screen. The resolution base is kept same too at 1024 by 768 pixels at 132 PPi (Pixel per inch. The finger print resistant screen of Apple iPad is far superior to any other competing product. However, if you have been using iPad and switch over to iPad 2 you would not notice any difference in terms of device’s display. Apple has introduced dual camera in the new iPad 2. The frontal camera can record in VGA mode at 30 frames per second while the back camera can video record in HD (720p) at 30 frames per second. The screen can be tapped for controlling video or stills at ease. The end users can Geotag over Wi-Fi for Photos and Videos. There no camera support enabled on iPad though and it was one of the most desired features as far as end users were concerned. Apple seems to have plugged-in a big gap by providing dual-mode camera on its best selling tablet device. iPad 2 is powered on A5 chip set while iPad was enabled on A4 chip. Both of these are low power chips that promise to deliver higher battery life to the end user. The custom designed chip is of 1 GHz and is manufactured to deliver high performance to the end users as they juggle between apps and start or shut down their iPad. The faster processing ability of new iPad will save time and resources from the end user’s perspective in the longer run. They’d be able to wrap up the complex tasks and operations in quick span of time without any hassles or constraints. Not much difference can be noted in terms of battery backup of both the models. iPad 2 promises to offer unparallel battery support of up to 10 hours in both Wi-Fi and Wi-Fi + 3G model. iPad offered 10 hours of battery back up in Wi-Fi version and 9 hours in Wi-Fi + 3G model. Probably a major improvement in this front could be registered by Apple as they release the next version of their iPad tablet in 2012-13.
iPad 2 would be powered on Apple’s new OS, iOS4.3 while iPad was enabled on iOS4.1. Apple has introduced finer set of multi-tasking capabilities in the new operating system and the end user would cherish using multiple apps at the same time without any constraints. The better chipset and faster operating system will take the overall usability experience to enormous heights in just about no time at all. Business users wanted this type of flexibility to be enabled on to the tablet in order to deal with the larger volumes of work in seemingly no time at all. The iPad 2 Wi-Fi model offers 30 pin dock connector port, 3.5 mm headphone minijack, built-in speaker and a microphone. iPad 2’s Wi-Fi + 3G model also includes an additional Micro-SIM card tray. The features are pretty much similar to that of iPad with only 30 pin dock connector missing from the list. In terms of sensors, iPad provided only Accelerometer and Ambient light sensor. The new iPad 2 additional provides Three-axis gyro as one of the sensors. iPad 2 recommends users to download version 10.2 or later for playing their favorite musical tracks. However, version 9.0 or later was recommended for iPad by Apple in 2010. The overall user interface and options have been aligned to fit through the new iPad and iPhone. The end users would cherish using higher version on the better and faster platform of the new iPad on the go. It is one such must to have apps for those who cannot afford to leave behind their music as they travel on assignments pertaining to work or personal leisure.